Nicotine is a substance found naturally in plants especially the tobacco plant, it is the part of cigarettes and other tobacco products that is responsible for addictions developing. It acts as a stimulant for most smokers and is commonly thought of as one of the most difficult addictions to overcome. Once nicotine is inhaled, it enters the bloodstream and is carried to the brain. Once here, it acts on certain receptors and stimulates hormones and adrenalin release. The increased adrenalin leads to an increase in heart rate, changes in breathing and a rise in blood pressure. The rise in adrenalin causes a surge in glucose production that can take effect as a rush of energy; this may be due to the inhibiting effects nicotine has on insulin release and also may explain why smokers believe their cigarettes help to reduce their appetite. The smoker experiences a fast acting sense of feeling good after the nicotine has reached the brain; it is this that contributes to the addictive quality of nicotine. These feelings of pleasure are caused by an increase in the production and release of a substance called Dopamine. Dopamine levels in the brain are not metabolised as quickly in smokers as non-smokers and the feelings of enjoyment remain for longer. As the body becomes simultaneously relaxed and stimulated by the effects of nicotine on the brain, the body becomes more dependent and the user often feels the need to take stronger or more frequent doses.It has also been found that nicotine can act as a depressant by altering the communication between cells of the nervous system. Some users of nicotine products find that they have a decrease in urine excretion, nausea and dizziness. Along with this, nicotine can also alter the fluid secretions of the airway with salivations becoming initial more productive followed by a period of dryness. Children are also at risk from the effects of nicotine as it can enter their systems also; it can lead to an increased risk of them developing asthma or even put young babies at risk of sudden infant death syndrome (SIDS).The inhalation of nicotine can also progress heart and arterial disease; on the whole, it is the other components of cigarettes that are harmful to physical health. Dental health can suffer as a result of smoking with teeth becoming stained, particularly from chewing tobacco.Nicotine is metabolised in the body via the lungs, kidneys and liver and any deposits are excreted in the urine. The more serious physical effects of nicotine come with the period of withdrawal. 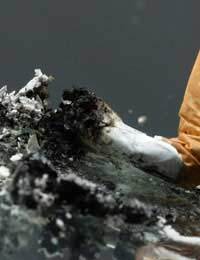 Physical factors that may be affected include experiencing headaches, nausea, vomiting, dizziness, tiredness, changes in appetite and occasionally constipation.Most of these effects can be controlled by other methods and will pass once the preliminary stages of withdrawal have passed.Most people are aware of the lethal effects of smoking and most of these are connected to other substances found in cigarettes and cigars, it is however the nicotine component that is responsible for the continuation of smoking and its addictive qualities.